Filed to: hairspray live!Filed to: hairspray live! Hairspray Live!—NBC’s televised musical event based on a movie based on a Broadway musical based on a movie—debuts December 7 and unlike its live holiday musical predecessors, it might be a success. The original cast recording is now available for streaming and let me tell you, it’s not all bad! The musical version of Hairspray is a wise choice for NBC—it’s contemporary, a good match for modern pop star voices, and, despite the 2007 movie version starring Zac Efron, it doesn’t have a giant fan base like, say, Sound of Music does. If anything, the only true Hairspray diehards are the ones devoted to the original (and truly great) 1988 John Waters version starring Ricki Lake and that—at least in the traditional sense—was not a musical. Compared to the original Hairspray Broadway cast recording (released in 2002), NBC’s version—featuring big voices like Jennifer Hudson, Ariana Grande, and Kristen Chenoweth—holds up. 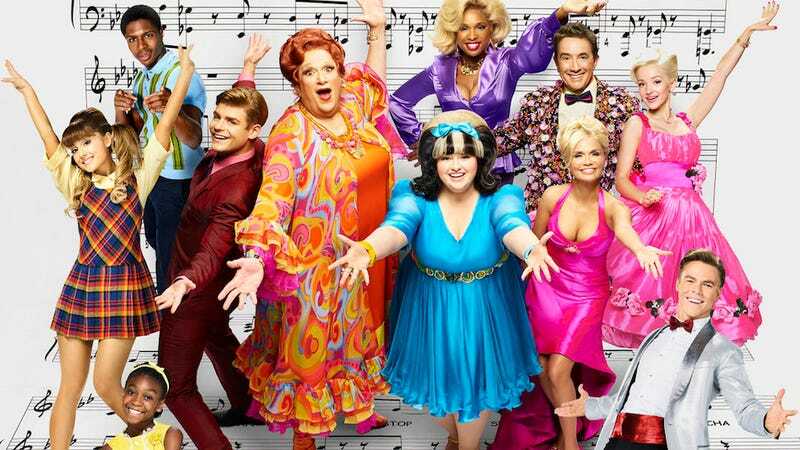 Lovers of the musical (which swept the Tonys in 2003) will be happy to know that Harvey Fierstein, who debuted the role of Edna Turnblad on stage (Devine played Edna in the original film), has returned for the NBC version, this time joined by Martin Short, playing her devoted husband Wilbur. Stepping into the lead role of Tracy Turnblad—a teen with a passion for dance and equality in 1960s Baltimore—is Maddie Baillio, a college sophomore with no professional theater experience who won the part at an open casting call. Andrea Martin, Billy Eichner, Garrett Clayton, Ephraim Sykes, Dove Cameron, and Shahadi Wright Joseph also star.